Former NFL receiver Mike Williams, a top-ten pick in the draft, had a problem with his weight. But nothing like former NFL offensive lineman Mike Williams, another top-ten draft pick. Williams, who recently signed with the Redskins, reportedly tipped the scales at more than 400 pounds before launching his NFL comeback. It was a decision by Williams to start shedding weight for health reasons that sparked his attempt to return to the league after last playing in 2005. Meanwhile, coach Jim Zorn claims that Williams is not a “fat guy.” The only way that’s true, in our view, is if Williams is secretly female. I think it depends on what your definition of “is” is. At 400 just put him at DT right next to Haynesworth. Good luck trying to move those guys. I never liked Mike Williams. Both of him. Is Mike Williams the WR under 300 pounds these days? I thought the same thing, but this picture made me think otherwise. Scroll about halfway down the page. I thought he was going to look a lot pudgier than that at 400. If (and a big if) he’s able to cut down the weight (I heard the goal was about 370), this could pay off for the Skins. It will be at least something to keep an eye on through the offseason. From just reading the headline, I thought you meant the former WR was at 400 pounds. Kinda hard to get separation at that weight. Rumor has it he is actually the former WWF Tag Team “Demolition”. Classy as ever, Florio. On the other hand, now we have a better idea what Mrs. Florio looks like. Of course by american standard 400 pounds is light !! what the hell Zorn is thinking not calling him fat , 400 pounds is fat Jim more like obsese if u ask your doctor . I don’t think you guys realize that although Mike Williams is heavy, he’s built like a tank. Muscle weighs more than fat, and this guy has a ton of muscle. just throw a steak towards the sidelines. Florio just hates fat people because he is a little twerp. For sure he got picked on by all the athletes when he went to HS. Some big fat ball player probably stuck him in a locker overnight. He really does not look that bad. Not like 400 pounds, at least. Why did you start it out with a comment about the WR Mike Williams? i guess his buisness ventures in texas r failing,so he is tryin 2 get some easy cash 4 a couple years.hope u get cut b4 camp mike. u quit on us bills as soon as tom donahoe picked you in the draft and it cost him his job. please go away and save a roster spot 4 someone who really wants to play the game. Good luck to the dude, seriously. He’s lost over 10% of his body weight, so he’s off to a good start. If he can come anywhere close to his goal, it will be quite the inspiring story. Just another jab at the Lions. 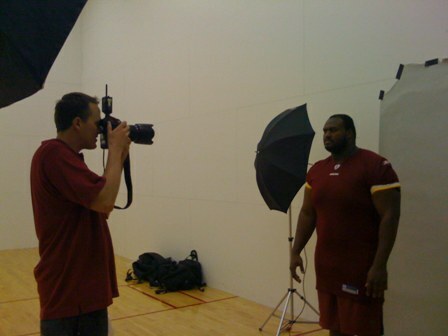 Here’s a training camp photo of him next to other Redskins linemen. He makes them look tiny. And last time I checked, Derrick Dockery is not a little guy. Yes, it will be a very inspiring story and Mike Williams should be held up as a role model for the youth of America. Of course, we need to tell the whole story. Big Mike Williams was perhaps the best OT in his draft class, so the Buffalo Bills took him with the #4 overall selection. The Bills then signed him to a very generous contract that paid him many millions of dollars. At that point, Mike Williams demonstrated his true character and that is that he is a theif. He lost interest in football, refused to work at honing his skills or staying in shape and ended up being cut by the Bills before the end of his rookie contract. After one wasted year with Jacksonville, he was out of the NFL. One of the top busts in the history of the NFL, primarily as a result of being a lazy bum. Now that he apparently realizes that the money he stole from Buffalo will not last forever, he seems willing to work to get back to the NFL, at least until he can sign another generous contract. I hope he fails miserably in his comeback attempt, because he has already received far more from the NFL than he deserves. I think Mike Williams $h!t in this guy’s cereal or something. the former lion probly still cant block either.